NEW YORK (CNNMoney) -- Businesses hired shockingly few workers in May, throwing into doubt the strength of the economic recovery. Only 69,000 jobs were added last month, the weakest growth in a year. The unemployment rate rose to 8.2%, the first uptick since last June. Private companies sharply cut back on hiring last month, adding only a meager 82,000 jobs. Employment increased in health care, transportation and wholesale trade. Manufacturing continued to add positions, albeit at a slower pace than earlier this year. Construction, however, suffered its largest decline in two years. The public sector continued to shed jobs, losing 13,000 in May. Economy: Are you better off? The overall figure stunned most economists, who laid the blame for the slow growth at the feet of Europe and Washington D.C. The steady drumbeat of headlines concerning Europe's financial woes, as well as the looming fiscal cliff in the U.S., is weighing on consumer confidence. Adding to the problems is the slowdown in the Chinese economy. "It was really shockingly low," said Bill Dunkelberg, chief economist for the National Federation of Independent Business, who said small businesses have pulled back from hiring because they aren't getting more customers. Meanwhile, the so-called underemployment rate rose to 14.8%, after falling or holding steady so far this year. Some experts say this rate is a better measure of the job market's health since it also includes people who could only get part-time positions and who have looked for a job at some point in the past year. The rising unemployment rate contained a glimmer of good news. It increased because 642,000 people re-entered the labor force, often a sign of economic optimism. Economists attribute the jump to graduating college students looking for jobs earlier, as well as jobs created at start-up businesses not captured by survey of established employers which produces the closely-followed payroll number. Still, the report marks a major turnaround from the beginning of the year. Job growth started off strong in the first two months of 2012, thanks in part to warmer weather that boosted hiring in construction and some other industries. But it now seems clear that the economy is not strong enough to sustain monthly job growth that exceeds 200,000, economists said. Gross domestic product, the broadest measure of the nation's economic health, grew at an annual rate of 1.9% in the first quarter, significantly slower than the 3% growth rate at the end of last year. As a result, employers don't feel the need to boost their payrolls. "It's not like businesses are being swamped with demands for goods and services," said Sean Snaith, an economist with the University of Central Florida. At the same time, companies are being very cautious because of the events in the U.S. and abroad. That isn't likely to change anytime soon, especially with the U.S. presidential election looming in November. "Whenever uncertainty abounds, it's hard to open the floodgates on hiring," said Ellen Zentner, senior economist at Nomura Securities. "I would expect to see anemic hiring persist over the next few months." But the overall job market still has a long way to go to climb out of the deep hole left by the financial crisis. Of the 8.8 million jobs lost, only about 3.8 million have been added back. Roughly 12.7 million Americans remain unemployed, and 42.8% of them have been so for six months or more. The number of long-term unemployed rose to 5.4 million, up from 5.1 million. Correction: An earlier version of this story incorrectly stated the number of jobs in the private sector. 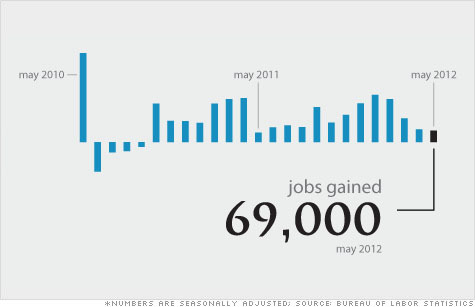 There were 82,000 jobs created in the private sector in May.